Today the Dallas County Commissioners Court voted to join the federal lawsuit filed by North Texas Congressman Marc Veasey and other elected officials and voters to stop the enforcement of Texas’ discriminatory photo Voter ID law. “This terrible law has been stuck down by the DOJ and then later denounced for ‘strict unforgiving burdens on the poor and racial minorities in Texas’ – nothing has changed,” said Taylor Holden, Dallas County Democratic Party Executive Director. “Perry and Abbott are not interested in electoral integrity, they simply want to restrict access to voting,” she said. 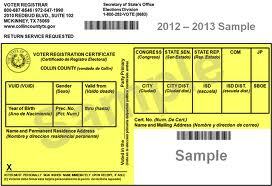 Last year, the Texas Secretary of State’s office did not find matching driver licenses or state-issued photo IDs for 2.4 million Texas voters, including 220,000 Dallas County voters. Dallas County has Department of Public Safety ID-issuing offices, but none in the southeastern quadrant of Dallas County, where many minority and poor voters live. Despite claims to the contrary, Voter ID comes at a high cost. Voters must take time off work, travel and pay for the legal documents that are prerequisites to obtaining the state’s “free” photo Voter ID. Birth certificates can cost between $8 and $25. Marriage licenses, required for married women whose birth certificates include a maiden name, can cost between $8 and $20. To compare, in today’s dollars, the notorious poll tax would be $10.64. We are proud of the Commissioners Court for their courageous action in support of sacred voting rights, which are as important as public health and public works. So, how does Dallas County have standing to sue the State on this issue?